It was in 1958, 53 years after the first Feast of Lanterns celebration was held in Pacific Grove, the first Royal Court reigned over the Pacific Grove Feast of Lanterns. From 1958 through 1964, the young women who participated were part of the Miss Monterey County pageant, and Queen Topaz also held the title of Miss Pacific Grove. Queen Topaz 1962 went on to participate in the Miss California pageant, won, and went on to compete in the Miss America pageant. These pageants provided the college scholarship fund and schooled the young women in public speaking and community service. 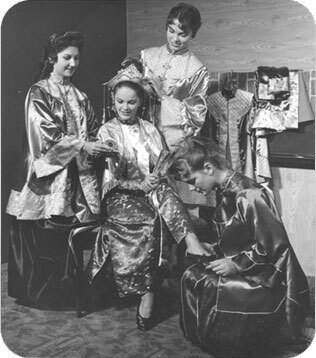 The traditions of the Royal Court as set forth in 1958 as part of an organization designed to assist young women prepare for their future continues today. In 1987, the Board of Directors established the Royal Court Scholarship Fund and created a process by which the community and the Board select the Royal Court from a group of middle and high school age applicants. In 2016 and 2017, Chang and the Royal Guard were added to provide the same opportunity for more young people in our community to serve as an ambassador of Pacific Grove along with Queen Topaz and the Princesses. The traditions and purpose of the Feast of Lanterns are held near and dear to the residents of Pacific Grove: To further and enhance the culture, history, and heritage of Pacific Grove through civic and cultural activities including the annual Feast of Lanterns festival. The Board of Directors and community members select the Royal Court and Guard each year with seriousness of purpose, because it is the responsibility of the Board, the Royal Court and the Royal Guard to keep whole the purpose and traditions of the Pacific Grove Feast of Lanterns. All applicants go through the same interview process. Queen Topaz is head of the Royal Court, and each princess represents a different gemstone. Chang is the head of the Royal Guard, and each guard represents an animal and an element. The guards are the knights and the court is the royalty. In addition, the Royal Guard will learn to perform a martial arts demonstration and take part in the pageant. It is a perfect way to give young men and women a role in this hometown tradition. The responsibilities and commitment required of the Royal Court, Royal Guard, and their families include time, energy and the ability to represent Pacific Grove in a positive manner at all times. Before applying, review the information included in the application package. Discuss with your family what is required of you and your family. We want to be sure that you understand the commitment you are making and the responsibilities you are accepting before you apply to be a member of the Royal Court or Royal Guard. Those who are in grades 8 through 12 at the time the application is due. Those whose primary residence is in the Pacific Grove Unified School District, although they are not required to attend a Pacific Grove public school. All applicants need to submit an application packet and go through the interview process. All individuals chosen are expected to fulfill the same obligations and will earn the same scholarship. The Information Meeting will be held on Tuesday, February 13th, 2019 from 5:30- 6:30 pm. This meeting is mandatory for the applicant and at least one parent or guardian of any applicant for the Feast of Lanterns Royal Court and the Royal Guard. The meeting will outline the commitments and responsibilities required of a Royal Court or Guard member, including the preliminary calendar (subject to change as events are added). Please bring any questions you may have to this meeting as there will be a question and answer session following. The applications to serve of the Royal Court and Royal Guard are due by 5:00 pm on February 28, 2019. They were posted on this website on February 1, 2019. If you have any questions, please us the "Contact Us" page.